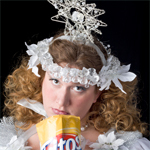 Germany, 1820s America, and 1850s America (including a Mummer’s play near the Irish Forge) and a horse-drawn wagon ride from the “Old World to the New World.” Tours leave every 30 minutes beginning at 6:00 pm; last tour begins at 8:00 pm. By reservation only: adults $15.00, children $8.00. Reservations required. 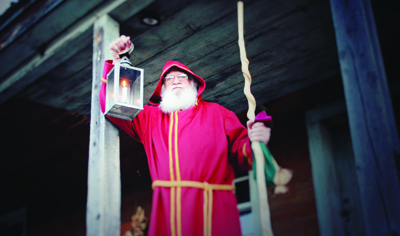 Visit http://www.frontiermuseum.org/lantern-tours/ or call (540) 332-7850. Blow Your Own Ornament at Sunspots Studios. Step into the glass studio and help the glassblower in creating a one-of-a-kind, keepsake ornament made with your breath. Ornaments ready for pick up or shipping the following day. Cost is $40-$45 per ornament. Suitable for ages five and up. Daily until 4:00 pm (last appointment at 3:30 pm.) Reservations recommended, call (540) 885-0678. A Christmas Carol – Join Marley, the three Christmas ghosts, the Cratchits, and Tiny Tim – they’re all back to take Scrooge on the ride of his money-grubbing life. The Santaland Diaries – An outrageously funny one-man play (from NPR’s well-loved humorist David Sedaris) about the author’s experiences as an unemployed actor/writer taking a job as an elf at Macy’s department store in New York City. Handel’s Messiah is one of the best-loved musical traditions during the holiday season. This Baroque-era oratorio inspires and amazes listeners even now, more than 250 years after it was composed. On Sunday, December 22 at 3:00 pm, join the Ovations Singers and Orchestra for this FREE concert at R. E. Lee High School. “I knew in a moment it must be St. Nick.” You might just catch a Santa sighting at Pufferbellies Toys and Books on either Friday, December 20 (from 6-8 pm) or on Sunday, December 22(from 1-3 pm), but you “better watch out” because all the photo sessions are fully booked and Pufferbellies is very busy this time of year. Still, you might be able to sneak a peek at the “right jolly old elf” while you shop for favorite toys and books. Happy Holidays from all of us the Staunton Convention & Visitor’s Bureau! Absolutely!!! Thanks for adding that.